“I am so thankful for this new well; I hope my back problem will improve soon.” She finally said ‘’Thank you so much on behalf of my family and the community of Deriba. God bless you! " Thank you, Water Charities Fundraising for your support of the Wine To Water Programs in Nepal and Ethiopia! The cost of rehabilitating the existing well in Kollo Village was $3,000 and $4,200 was applied to cost of the new well in Deriba Village for a total contribution of $7,200. Each well serves nearly 300 and 390 people respectively for a total of 690 beneficiaries. Traditional drinking water sources include unprotected shallow hand-dug wells, springs, and rivers. The hand dug wells are not sealed and water is drawn using inner tubes or buckets. Being shallow, the wells stop yielding in the dry season as the water table drops. Typically, wells in Ethiopia are 3 to 8 meters in depth but do not penetrate deep enough into the aquifer to provide a source of water throughout the year. The average fluctuation of the water table is 2 meters. The wells repaired and constructed are sealed from contaminated runoff and penetrate at least 10 meters into the aquifer. A new Water Use Committee was formed for the new well comprised of 4 women and 3 men elected by the community. This Committee is responsible for maintaining and repairing the pump and can charge a user fee to raise the funds to do it. Each of the heads of households went through training to improve sanitation and hygiene practices in their homes. 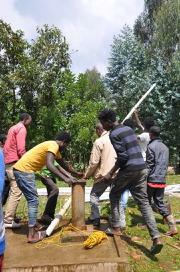 The Deriba well was constructed using the manual percussion method and fitted with an Afridev handpump. The pump suction position was set at 15 meters. PVC casing was installed with water ingress sections located opposite the most permeable zones (fine sand aquifers). River gravel was packed around the casing and the well was developed using compressed air. All the pump parts were not working as a result of siltation. The people had to travel over 3km round trip to get water from an unprotected spring source. The well was developed and cleaned with all new rods and pump unit supplied and installed. The well disinfected with chlorine. Tadelech Hamero is a 30 year old woman and matriarch of an 8-person household including her husband. She married at an early age and at the age of 30 she is the mother of 6 children. She said, “I quit my education early and opted to marry at the age of 16 due to a burden on women who are responsible for all household works including milking and cleaning cattle dung as well as fetching water from the well location far from my parent’s house. I regretted cutting classes and later on quitting school. One main reason was the lack of clean water in my village. I was traveling daily for water which took me 1 hour to bring water from the well. For this reason I was frequently absent from school lessons... "
She added that very recently she was unable to carry water containers on her back as she is feeling spinal cord pain in addition to delivering and raising six children. With the new well now in place, the village women and children are now alleviated of the burden of walking far to get water. Wine To Water worked closely with the community of Dahakhani to complete the construction of 34 taps stands in rural Nepal. The water was brought in from over 4 kilometers away and involved the construction of collection tanks, sediment tanks, and reservoir tanks. In addition to the completed water access project in Dahakhani, Wine To Water Nepal conducted Hygiene lessons in local public schools and Phase II is starting filter distribution for household purification and continuing community WaSH education. The cost of the school WaSH project was $2,105. The Shree Rashtriya Madhyamik School WaSH & Livelihood Imporvement project benefits about 500 students through safe water, improved sanitation/ hygiene, and behavior change. The school is within Dahakhani village, in the foothills of northern Chitwan, where the community-wide W|W water system benefits 1,819 residents. Improvements included: Adding a water pipeline to the school from the main distribution line, Plumbing pipelines to toilets, Child friendly hand washing platforms, Dustbins for safe storage of garbage, Educational programs and trainings. Scroll down for videos, photos and interactive maps detailing the overall impact. Glimpses of our Work in Nepal & Ethiopia! Fig. 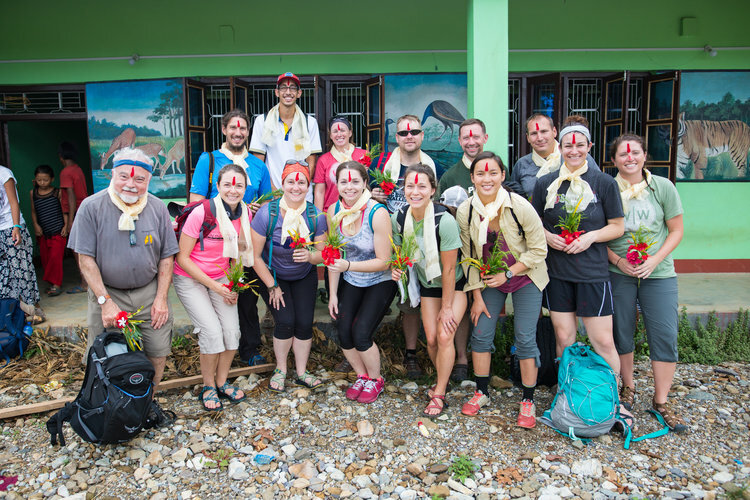 8 Nepal - Wine To Water volunteer group in 2017 in Dahakani! THANK YOU Jammin'4Water! We are grateful for your continued support!